Instead of indulging in false propaganda, our party believes in reaching the people with concrete programmes and policies to seek their blessings in the form of votes. It is the reason due to which Narendra Modi has become choice and voice of each voter across the country. This was stated by Member of Parliament & J&K Prabhari Avinash Rai Khanna while addressing media persons at party headquarters on Thursday alongwith State Vice President Col. Uttam Singh, State General Secretary Kavinder Gupta, Political Advisor to BJP State President Prof. Hari Om, party leader Farooq Khan and Jammu Poonch Parliamentary constituency Incharge Yudhvir Sethi.Avinash Rai Khanna said that ours is not only a political party but a mission with very clear vision and programmes aimed at making the nation self-dependent in all matters and a prosperous land with each citizen living dignified life and in a position to manage every basic item for survival. He said that it is the basic mantra which the people across the country have accepted as a result of which they are looking for the day when BJP forms government at the Centre with Narendra Modi as Prime Minister. Khanna said that after independence the country had an opportunity to have Lal Bahadur Shastri and Atal Behari Vajpayee as Prime Ministers who were born in common Indian families and became PMs to run the government by the dint of their hard-work. Now, again BJP’s Prime Ministerial Candidate Narendra Modi too belong to a common family and the people want to give him a chance as they have themselves seen that a common man can run the country more effectively and plan programmes and policies for the welfare of common man. 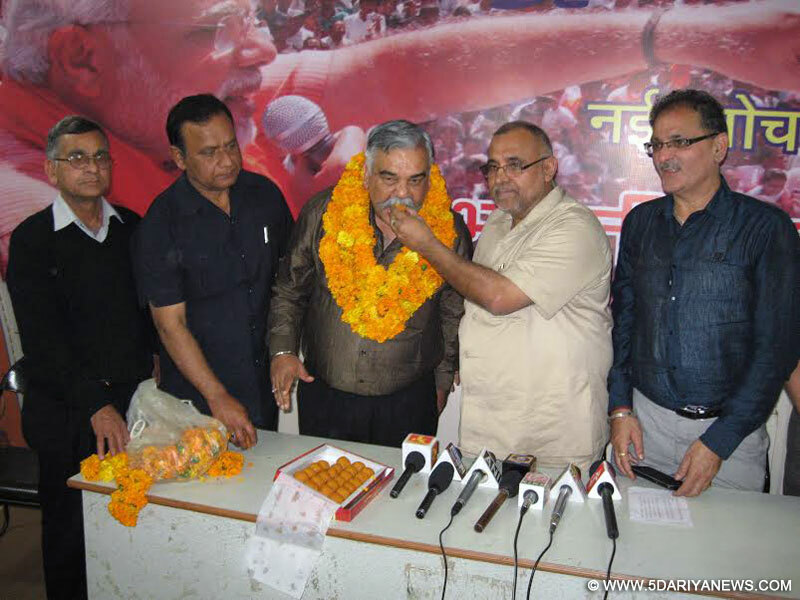 Khanna said that Narendra Modi has become a unanimous choice as the challenges faced by the country can only be tackled effectively by a leader like Modi and today he has become a voice and choice of masses.Earlier, Avinash Rai Khanna welcomed Brigadier (Retd) Anil Gupta into party fold. He said that joining of a very senior army official is clear indication that the disciplined men of the forces want to continue to render their services for the nation even after retirement. He assured Brigader Anil Gupta that the party will give him full respect and utilize his vast experience to fight the anti national forces in the state.